The following is a brief description of the cars produced under the Marcos name to date. The car was powered by a Ford 105E engine and it's high roof was dictated by Jem's considerable height (something which makes all Marcos cars a good choice for taller drivers, to this day). The original car was built in Dolgellau, Wales by Frank Costin and Dennis and Peter Adams, but it was later built in a small production run in Luton. 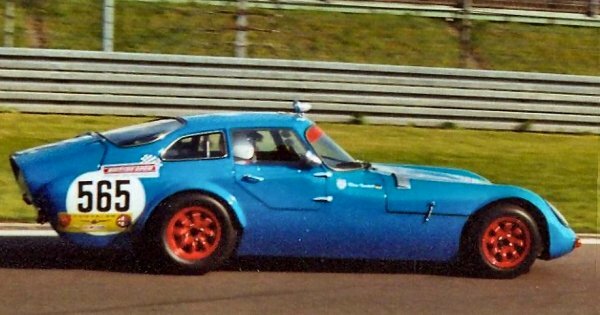 The Adams brothers and Jem Marsh realised that to make a good living out of building Marcos cars would require something with a wider appeal than the Xylon, successful though it was as a race car. The first step was to redesign the bodywork of the Xylon to be a little sleeker and this car was known as the Luton Gullwing (because, by now the cars were being built in Luton). This car still sold mainly to racers, although a few were sold as road cars. Once again it featured gullwing doors, but was a much more attractive car than the original 'Ugly Duckling'. The next step was to design a new car around the existing wooden chassis and this was to be a convertible or Spyder in Marcos speak. However, the demand from racers for a roof, caused Dennis Adams to hurriedly design a roof for the car, which is not a million miles away from the design now so familiar to Marcos afficenados. This model is known as the 'Breadvan' because of it's slightly boxy roof and boot line. The downside of fitting this roof was that (due to the use of the gullwing chassis, but not gullwing doors) the doors were tiny and climbing in and out was extremely difficult. A number of these cars were sold, mainly in coupe form, but it was only a matter of time before a new car, designed primarily as a road-going GT took over from the somewhat impractical design. It almost goes without saying that all these models were successful racers and, like other models, race to this day in both national and international classic car series throughout the world. In 1962, the Adams brothers designed a radical 3 seater, mid-engined car to replace the Fastback. Featuring a central driver's seat and two set back passenger seats it predated the McLaren F1's use of this layout by 3 decades! Unveiled at the 1963 Earls Court racing car show, the GT (all Marcos cars prior to the Mantis were known purely as the GT, although some picked up nicknames along the way), was a sensation. At 43 inches at the roof, this was one of the lowest cars ever produced and its long bonnet and Kamm tail, although reminiscent of the E-Type and even the Ferrari GTO, were remarkable for their time, especially for a small manufacturer like Marcos (Compare the lines with the Austin Cambridge or Vauxhall Victor of similar vintage!). Originally, the, once more, wooden chassised car was equipped with a Volvo engine from the P1800 and had a complex De Dion rear suspension and heavily sculpted dashboard. 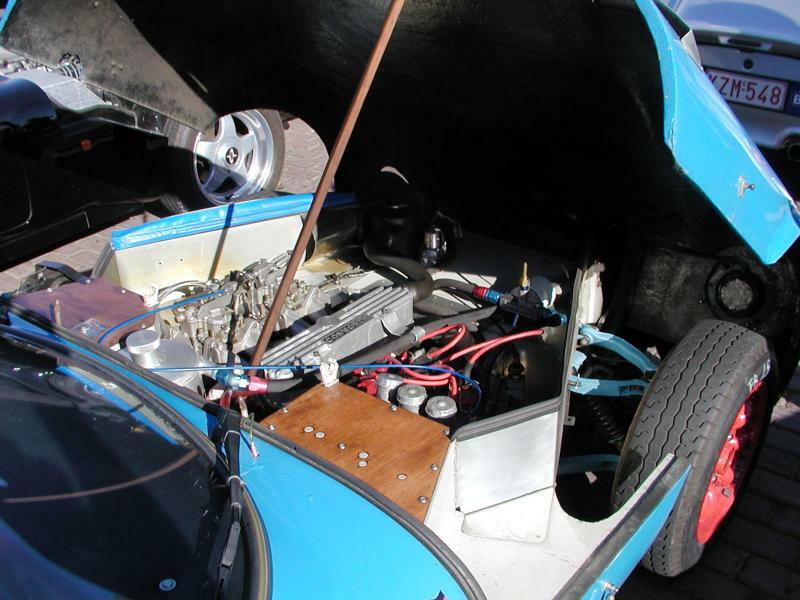 However, high cost and limited sales of early cars, soon saw a movement to a Ford powerplant, a simpler dashboard and a live rear axle, held in place with a panhard rod. One feature which appeared on this model and has been retained to this day is the adjustable pedals. Rather than have a seat which moves back and forth on runners, the Marcos has a fixed cushion for squab and seat back and the pedals move in relation to the driver. The position of the pedals is easily adjusted by a wheel on the dashboard (or on recent cars, electric motors). 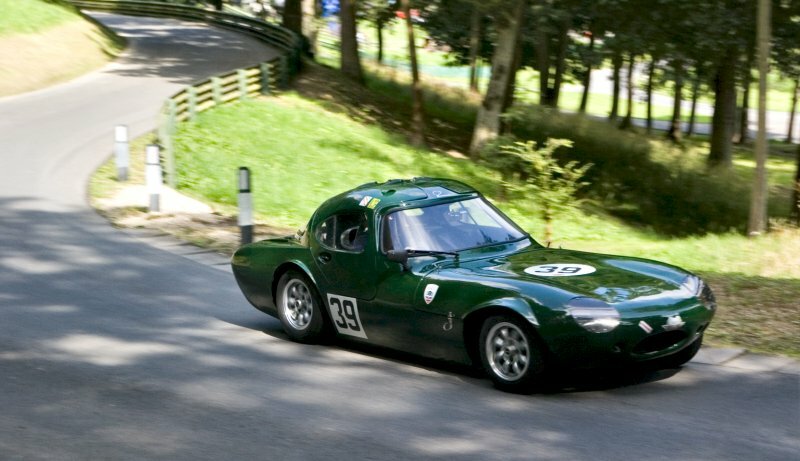 This feature is almost unique, but makes the Marcos a supremely comfortable car in which to travel and allows a laid back driving position, virtually unknown outside the world of single seater racing cars. Early sales of the GT, which had been designed as a road car, were to racers and once again the car proved its worth on the track. 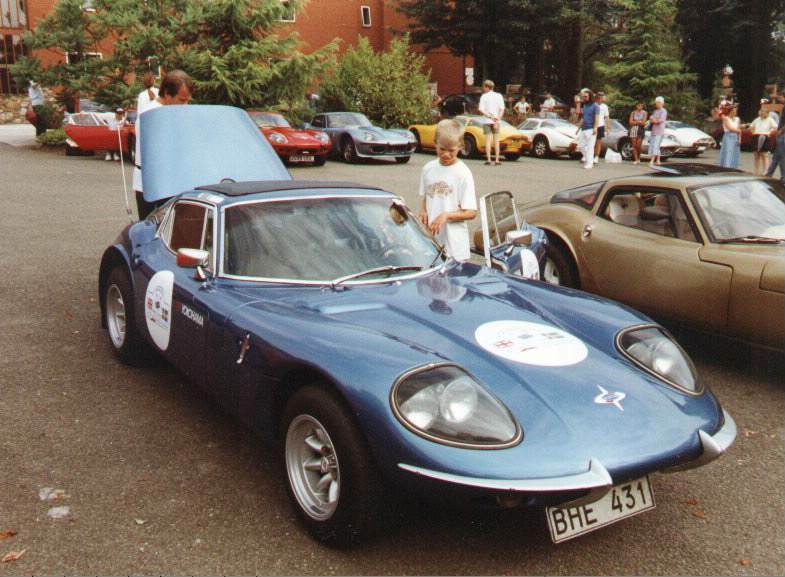 To this day the 1800 and Marcos is a competitive car against both class and bigger engined competition in both FIA and HSCC championships, especially in the hands of people like Roger Ealand, Per Hagermark in Sweden (his car pictured above) and Dave Methley. The Ford 1500 engine was supplemented, in time, by a Lawerencetune modified version enlarged to 1650cc, the ford 1600 x-flow and eventually, shortly after a failed attempt to qualify a 1600cc car at Le Mans, the Ford V6 Essex engine. In 1969, the cost of producing the wooden chassis and an abiding doubt in the public's mind about a car with a wooden chassis, led to the adoption of a steel chassis. Outwardly the car was unchanged and the performance and handling of the car was also hardly altered. At first the steel chassised cars, built in a converted mill in Bradford Upon Avon, Wiltshire, were powered by the Ford V6 Essex engine, but a desire to move into the lucrative US market saw the use of a Volvo straight 6 engine, which already had the necessary anti-pollution equipment available. Some cars also had a 2 litre V4 version of the Essex fitted, but most of these are now converted to V6s. A few GTs were built with Triumph 2.5 litre straight sixes, using up supplies of engine originally intended for the 4 seater Mantis. The relaunch cars of 1981 were essentially the same cars which were produced in 1969, although they were often sold as kitcars and some had the German Cologne V6 in place of the Essex. 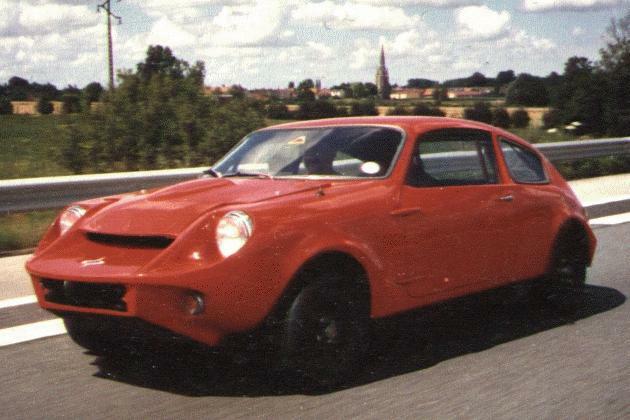 The car was equipped with a Triumph TR6 engine and a few have been converted to use the Rover V8. It briefly reappeared in the 80s as the Autotune Mirage - in kit form, but seems to have had a brief and inglorious history. 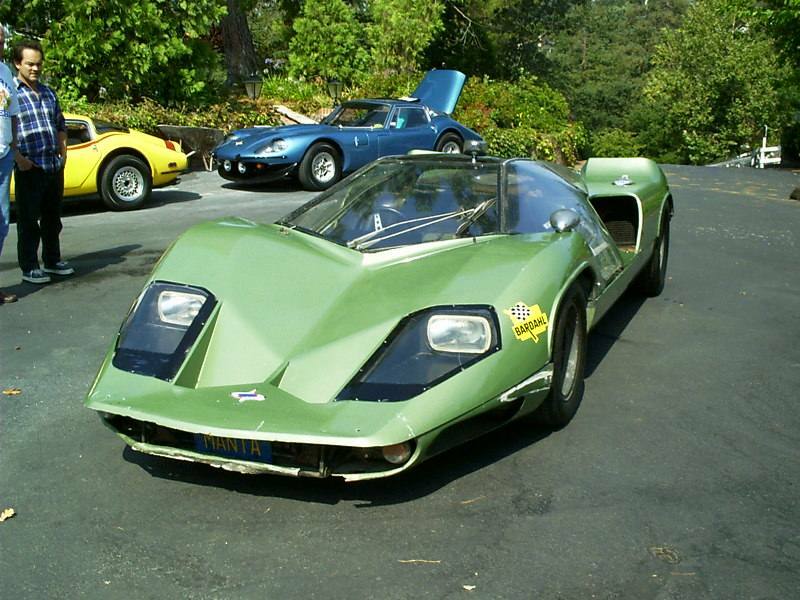 The Mantis name was first used when Marcos decided to build a true sportsracing car. and the Mantis 4 seater. The car was built to accomodate the BRM-Repco V8 and was, to date, Marcos' only mid-engined car. 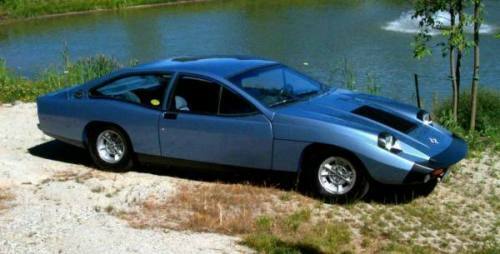 The car was angular, borrowing a few styling hints from the Adams' Probes. The car only raced at Spa, in 1968, when it ran reasonably until the electrics failed in torrential rain. The single car built was sold to the States and is still there, where it still used, albeit (at present) as a highdays and holidays road car (fitted with a Buick V8). It has since been restored and was brought to the UK for the marque's 50th Anniversary rally. 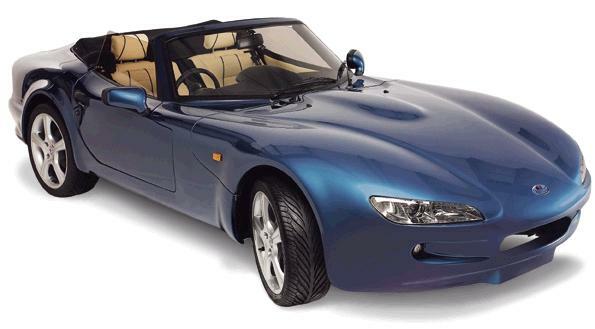 The Mini Marcos - Ugliest car in the world or GT wonder for the masses? 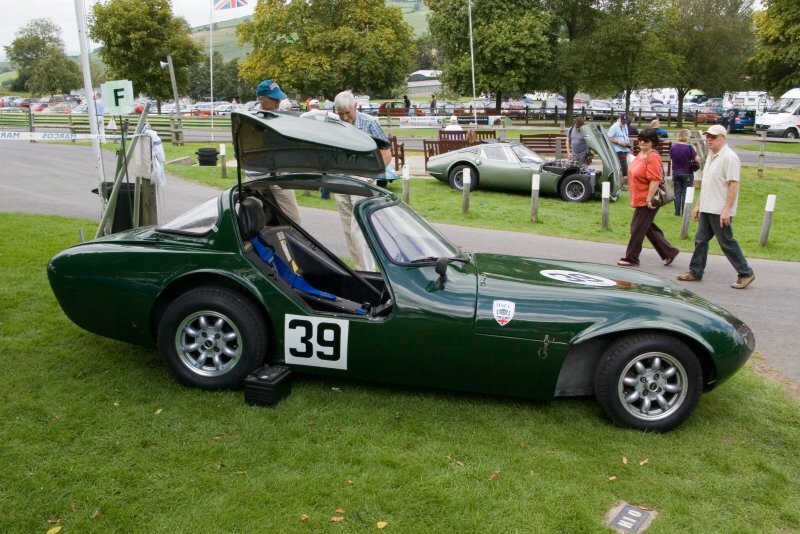 In 1965, the only Marcos not designed by Dennis Adams other than the original Costin Xylon was unveiled. 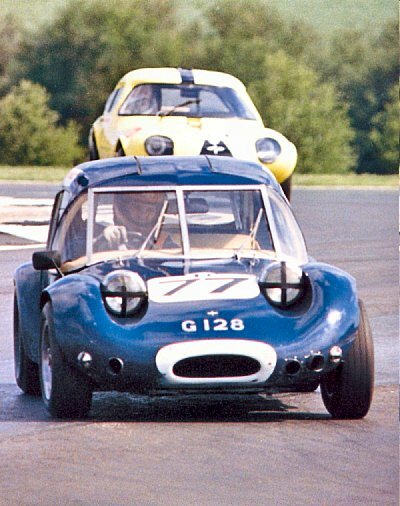 The Malcolm Newell designed Mini Marcos was intended to fill the gap for a cheap GT sportscar and it was based, as the name suggests, on the Mini. At £199 for a bodyshell and windscreen, the Mini Marcos certainly fulfilled the 'cheap' part. The 'unconventional' styling was dictated by the decision that the car should take the Mini components in unmodified form, the bulbous front housing the standard Mini radiator. 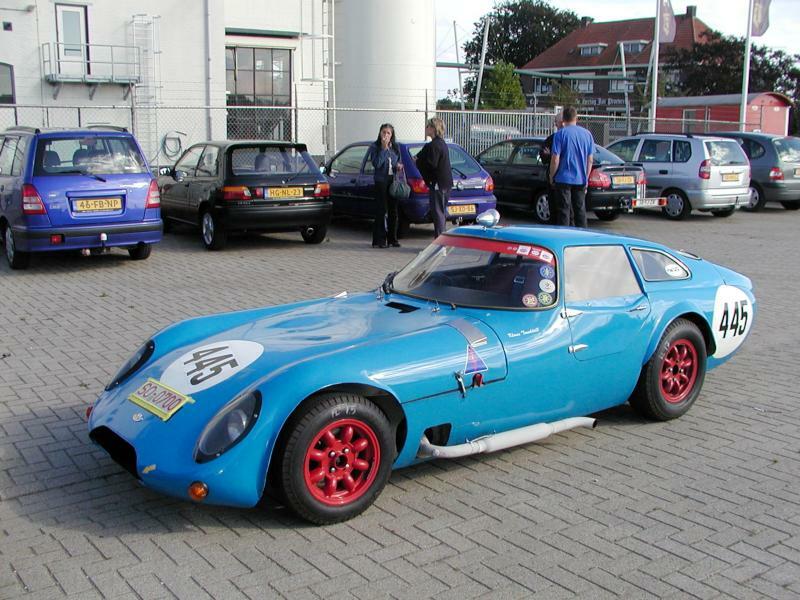 Whilst few would call the Mini Marcos an attractive car, it has proved a highly effective competition car. In 1966, a Mini Marcos was the only British car to finish at Le Mans and it has competed in numerous forms of motorsport ever since its release. Perhaps the Mini Marcos' greatest claim to fame is the fact that it was the first Corgi 'Golden Jacks' car with removable wheels. Ironically, this and the various GT Corgi Marcos cars, sold in hundreds of thousands, whilst the real thing is a rarity, often unknown even to car enthusiasts. At one point the moulds and rights to the Mini Marcos were sold and eventually it metamorphised into the well regarded Midas. 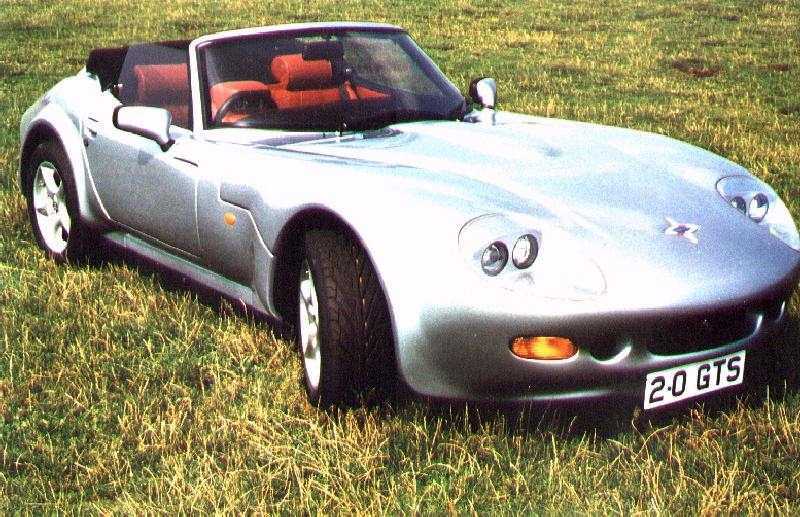 However, Midas went bust and the terms of the original sale were such that in such an event the rights to the Mini Marcos would revert to Marcos, even though the Midas was bought up and revived. In 1991, mainly due to demand for all things Mini from Japan, the unthinkable happened and the Mini Marcos went back into production. Models bound for Japan had catalytic convertor equipped 1.3 Cooper engines and air conditioning. A thriving club devoted to the Mini Marcos exists and owners are fiercely loyal to their cars. There's a lot more that could be said about the history of the MM - it's evolution from the D.A.R.T. (which was the prototype for the Mini Jem). The split between Jem and Dizzy Addicott led to two cars instead of one, and the Mini Marcos was designed (well put together :-) in double quick time to fill the gap. The Mini Jem, so-named by Jeremy Delmar-Morgan and not Marsh, appeared a year after the Mini Marcos. Although some Mini Marcoses had appeared in 1965 (Geoff Mabbs thrashed the opposition on the car's first outing at Castle Combe in September '65) it was officially launched at the Racing Car Show at Earls Court in January 1966. The Jem was launched at the same show in 1967. Sadly the Mini Marcos is no longer a current model, though Marcos would consider a licensing deal if someone wanted to produce it. The last Mk. V shell left the factory in June 1995 and was sold to a customer in Switzerland. 65 Mark Vs were built, of which only ten were exported to Japan. According to the Club's records at least 1260 Mini Marcoses were built including the Harold Dermott Mk. IVs. Since I wrote the bit about the Mini Marcos there have been some developments. Two more Mini Marcos Mk. V shells have been produced as "spare parts" for a French outfit that intends to race them. There was a sufgestion that more could be produced for a one-marque series but whether that comes about remains to be seen! The last I heard was that the two shells were sitting in the factory wrapped in polythene. My other discovery is not new, but I have learned a little more about the South African and Irish Mini Marcoses. Some 40 cars were produced under licence in Pietermaritzburg for the South African market and mostly used for racing. Another batch of 40 was made under licence in the Republic of Ireland (body numbers MI1 to MI40). This brings the total to at least 1340 cars. Launched in 1984, the Mantula was very similar to the GT of 1969, but subtle bodywork modifications hid the most significant change; the addition of the powerful, light and highly tunable Rover (nee Buick) V8. With this engine, even in standard form, the Mantula could accelerate from 0-60 mph in under 6 seconds and the improved aerodynamics allowed speeds of around 140 mph to be reached. The Rover engine also came with a slick 5 speed gearbox to complete the picture. The Mantula is arguably the most desirable Marcos for day to day use, especially a version with the Granada based independent rear suspension. The bodywork is little changed from the original Adams design of 1963 and the Rover engine is a delightful unit. The Martina looks, to all the world, just like a Mantula with slightly flared front wheel arches, but lifting the bonnet reveals the 'raison d'etre' of this car. The Martina was intended to bring Marcos ownership to those who could never afford it (The Marcos has never been a cheap car - in the 60's they were dearer than E-Types) and allowed the classic shape to be built around Ford Cortina mechanics (the flared arches accomodating the wider steering rack of the Cortina). Many Marcos owners viewed these cars with disdain, but having driven a beautifully built version with a tuned 2 litre Ford OHC engine, I'd say that there's little to choose between one and, say a V6 GT (except for the sound, the V6 is lovely) and, with humble Ford mechanics, insuring and running one can be a lot more affordable than a Mantula. The Martina was available as an alternative to the Mantula, which continued to be built. 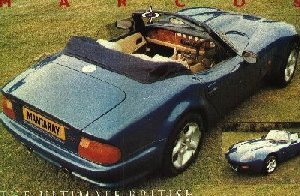 However, despite selling well, the Martina's lifespan was short, as in 1993 the factory made the momentous decision to abandon 'component cars' (Jem claims kit cars are Duttons built on clapped out Escorts) and move into direct competition with the likes of TVR and Porsche by building and selling only fully built, type-approved cars. The result is the Mantara. Once again the Rover V8 engine was used, this time in 3.9 form (although the current range includes a 5 litre Rover V8! ), but strut suspension forced Dennis Adams to add Audi Quattro-like blisters to the front wings, which, in my opinion, sadly don't blend in well with the original shape. However, the Marcos continues to impress reviewers, especially with its handling and refinement (one daring to say that he felt the Mantara handles better than TVRs latest offerings), and its a source of amusement amongst Marcos owners that journalists still marvel at the adjustable pedals! With substantial financial backing and a successful race program, Marcos cars continue to sell well. From 1986, the Mantula was available in Spyder form and this was carried on through the Martina and Mantara models and into the LMs. 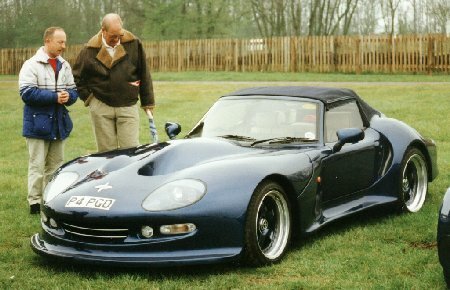 The unveiling of the LM racer at the Earls Court motor show in 1993 was the annoucement of a dream; for the Marcos marque to return to Le Mans. No doubt Jem had harboured this desire for some time, but Dave Lewis, the Thames Valley co-ordinator of the Club Marcos International, must be credited with re-awakening it in the factory and their backer, Computacenter. He had approached the factory with the idea a year earlier, and they agreed to build a car, if he could find a backer. He was unable to, but the factory were cheered by the interest and the LM400, 500 and 600 are the result of that. 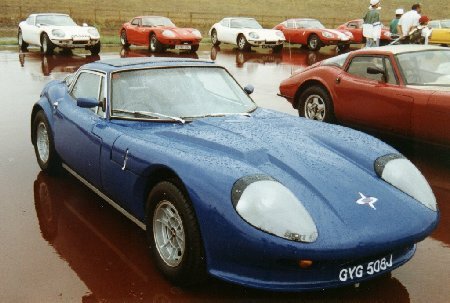 To enter GT racing, the Marcos factory were obliged to offer a certain number of cars similar to the race cars to the public as road cars. 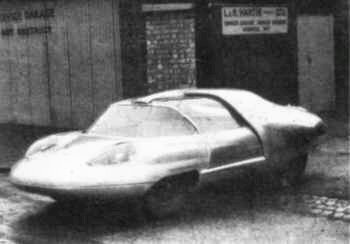 The Mantara was not quite suitable for a race car and so the sleeker LM500 was designed and built. The first car was an outrageous yellow convertible which did the rounds of the motoring press, complete with electronic instrumentation, but most LMs are actually sold with more traditional wood, Wilton and Conolly interiors. The LM400 and 500s are essentially the same, just having the 3.9 litre and 5.0 litre Rover V8s. 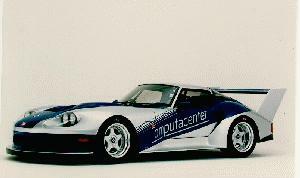 The LM600 is the 1995 Chevrolet Corvette powered race car, (any actually sold as road cars?) and has even more radically altered bodywork. 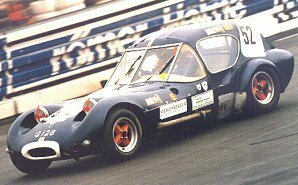 Whilst the LMs are undoubtedly not cheap cars, it's probably still the cheapest way to drive a car which raced at Le Mans, just as it was 30 years ago in the case of the Mini Marcos. In 1997, Marcos reused the Mantis name. 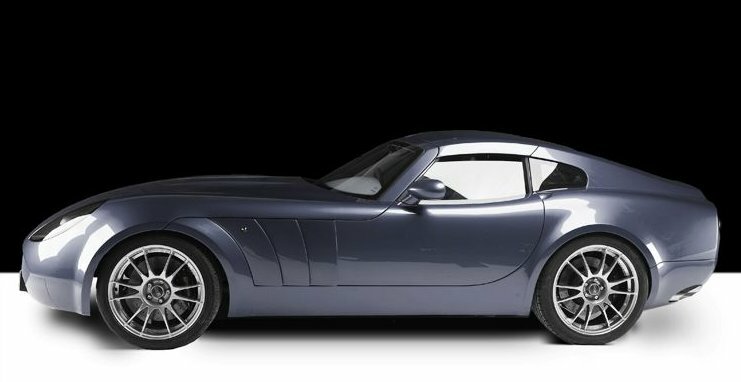 I had hoped this was a 2+2 version of the long lived coupe, but in fact it was the latest development of the LM-series cars, and has a quad-cam, small-block, Ford Cobra V8. The front-end has been improved by smoothing the various aerodynamic addendums into the bonnet, so that it looks sorta like the old GT. The headlamps are now a pair of small, high intensity units that make the old (well, not that old!) units look huge and clumpy, and this further enhances the front-end. From the windscreen back it looks like the LM series cars. Oh, 0-60 in 4.2 secs, and a top speed of 170 mph! The showcar was a very tasteful purple with a turquoise leather interior, and a convertible. Price is about £42,000 and Graeme Sutherland (who provided this information) would like one. Autocar tested this car and reported that "The doors close with a satisfying clunk, the interior doesn't rattle or squeak and nothing failed or fell off during the course of its time with us - a rare occurence for any low volume British sportscar in our experience" and commented that "How a company that builds just 70 cars a year can...design, engineer and produce a car as good as the Mantis is beyond comprehension". Their verdict was "A credible rival to the TVR Griffith" - Praise indeed. Launched, originally, for the European market, the GTS is powered by the Rover two litre engine originally found in the Rover 200 and 800s, in either turbo or non-turbo form. In turbo form, the engine certainly doesn't lack power or torque. The 200ish BHP being enough to get the GTS to 60 in a little over 5 seconds. The quality of the modern Marcos was again echoed with A&M saying 'the GTS...was superbly built and finished and had none of the worrying noises you sometimes hear in a low-volume sportscar'. 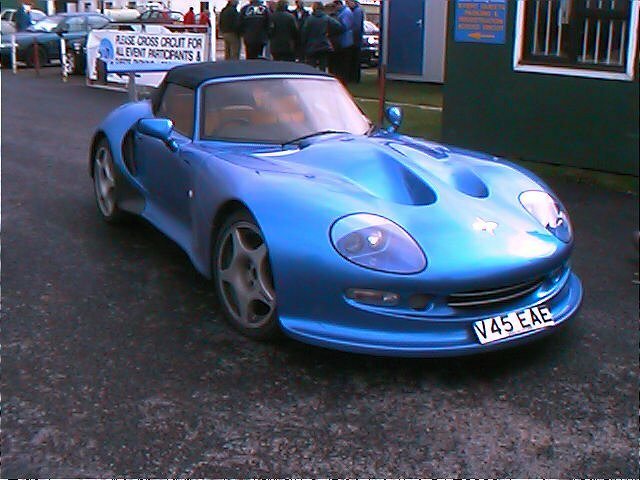 Marcos claim that the GTS was released onto the UK market in response to the waiting list for the Lotus Elise, but it's hard to see Elise buyers being the natural candidates for the GTS as it is much more refined, but less no-compromise road racer than the Lotus and it is around £9,000 more! 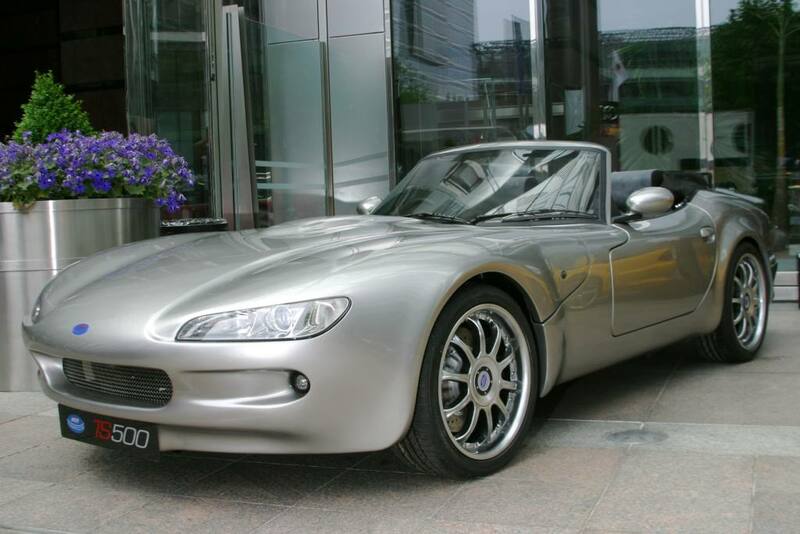 I'd imagine it'll attract buyers who like the idea of a Marcos, but are less keen on the idea of V8 fuel consumption. 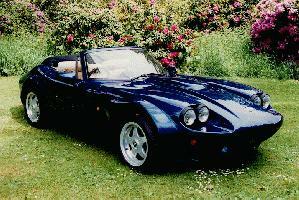 At the 1998 British Motor show, Marcos launched a new model named the Mantaray. This saw the first major revision to the rear of the car since the GT's launch in 1963! The distinctive drop away tail was changed for a much flatter boot level with the rear window. Very reminiscent of the TVR Chimera's rear, the Mantaray shape was well received by the motoring press and provided an even larger boot. The car was made available with all engine options from the 2 litre Rover engine (with and without turbo), through to the 4.6 litre V8 Ford engine used in the Mantis. Initially it was planned to continue to make the old shape available alongside the new Mantaray, on request. The Mantis GT is a supercharged version of the Mantis launched in 1997. Boasting 500 BHP and a top speed of around 180mph the car is certainly in the supercar bracket. Tiff Needell, in his Top Gear review, described the car as "Exuding character" and recorded a 3.96 second 0-60MPH (according to the standard on board telemetry) in a distinctly unscientific test! Evo summed the car up thus, "if the Evo car park plays host to a more exciting car this year, I'll be very suprised". After Marcos fell into insolvency, Jem Marsh and Rory McMath, with backing from a US backer, launched the Marcasite TS250 in 2002. The TS250 is based upon the Mantaray, but has an all new interior and uses Peugeot headlamps to give a totally new look to the front end. The car was aimed at a different market to the fire-breathing Mantis and LM models. Fitted with a 175 bhp Ford V6, the car is by no means slow, but it is easier to drive and less intimidating than the Marcos of recent years, or the competitive TVRs. Jem and his team see this car as appealing to people with a need for a daily driver and, interestingly, to women in the market for a distinctive sportscar. More information on the TS250 here. Marcos continued their return in 2003 with the lauch of the TS500. This is a revised version of the TS250 (The Marcasite name was quickly dropped), with a Javelin Engineering prepared 5 litre version of the Rover V8. Producing 320 BHP and weighing just over the tonne, the TS500 addressed some complaints from owners of LMs and Mantises (and some of the press) that the TS250 was not really the kind of car expected from Marcos. The reduction of price of the TS250 (to under £30K) and the pricing of the TS500 at the £35K mark also went some way to counter concerns that, good though the chassis was, it was a bit too dear. More information on the TS500 here. 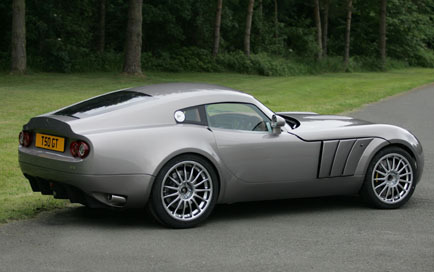 In 2004, Marcos launched possibly their most radical car since the 1971 Mantis. 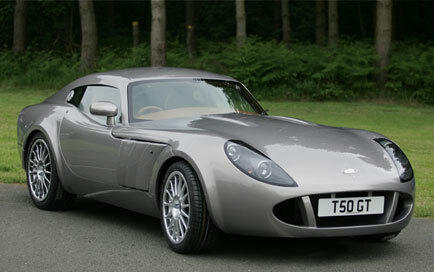 With Tony Stelliga's backing and Prodrive's know how, the Chevrolet V8 powered TSO features revised suspension, a redesigned front end, courtesy of former TVR designer, Damian McTaggart) and comes in two versions, the 350BHP TSO, with a five speed gearbox and the 400BHP TSO R/T with a six-speed gearbox. With the 'O' standing for Omologato (as in the Ferrari GTO), Prodrive (responsible for the Ferrari 550 GT cars and Subaru's rally programme, amongst other things) involved in refining the suspension and the race proven Corvette engine, thoughts of a return to racing, maybe even Le Mans, must be in the management's mind. 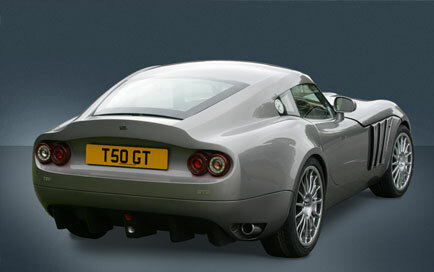 In late 2004, Marcos launched the TSO GT Coupe in Australia. Built to Australian regulations, unveiled at an Australian race meeting and only for the Australian market, it seemed a nice idea, but slightly odd. 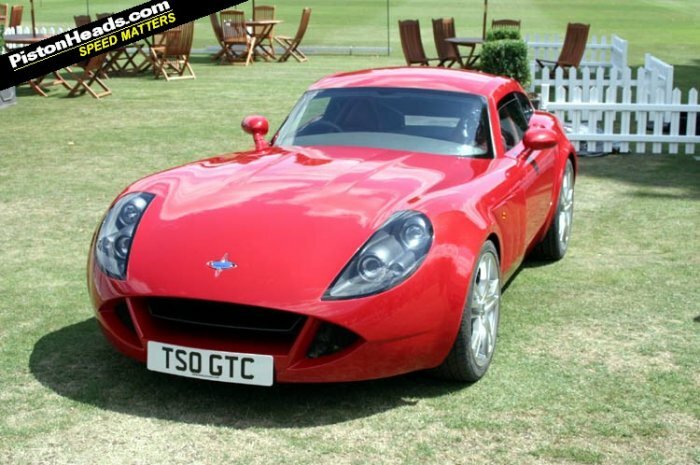 In 2005, Marcos made things a bit clearer by launching the GT2. Available for the European market, it carried forward the design and most of the features of the GT coupe, but in a form more widely accessible. 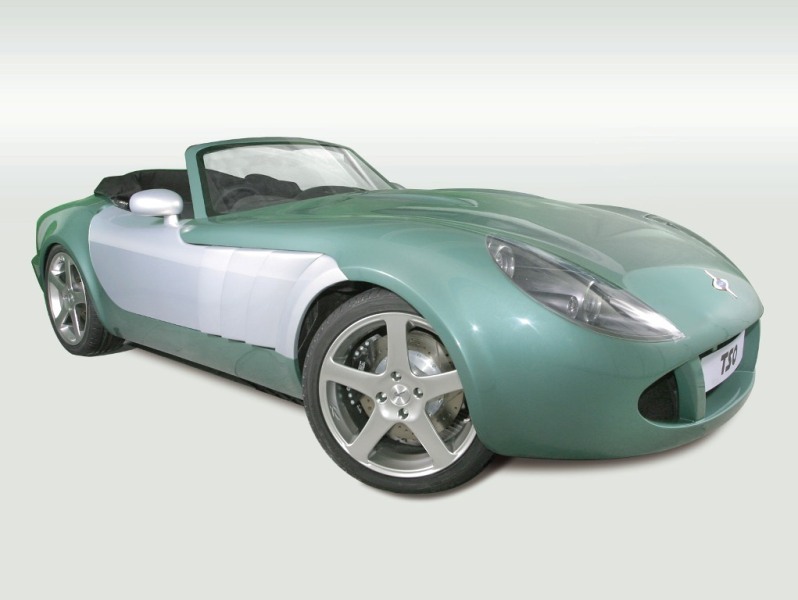 After only a few Mantis coupes (mostly for the Mantis Challenge race series) were made, this was a welcome return to the classic closed style Marcos was originally famous for. Mechanically, it's identical to the TSO convertible. The styling harks back to the classic Marcos GT, but few lines or parts can be identified as carried forward. Rear visibility, always a good point on Marcos GTs, especially rear 3 quarter visibility, looks compromised by the heavy three quarter panels and the car has a slightly heavy browed look, to my eyes, with that low roofline. However, from the photos, the build quality looks good and the overall line is excellent. Performance, too, promises to be excellent, with 0-60 in 4 seconds, 0-100 in under 10 and 50-70 in just 2! 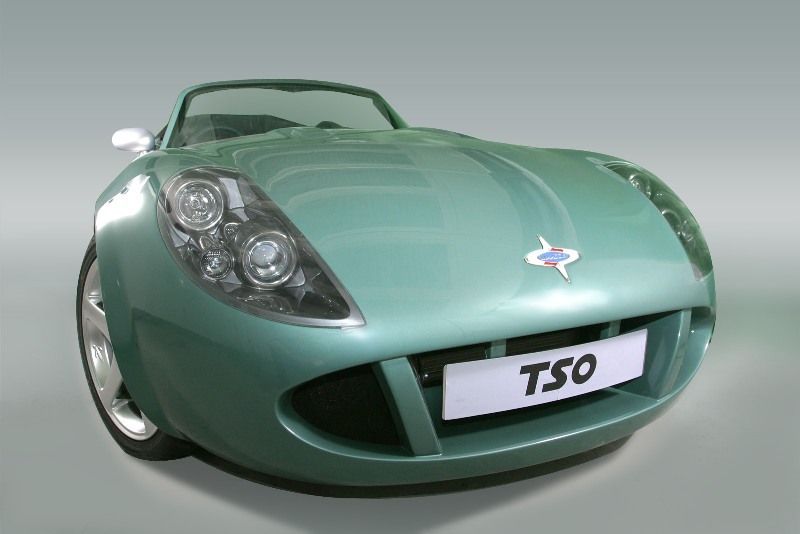 In July 2006, Marcos unveiled production versions of the TSO. There was a targa topped version, as well as the coupe, which appeared pretty much as seen before. GTC Photo courtesy of Pistonheads.com. The TSO is a performer – a lightweight composite body, space frame chassis and V8 engine provide an impressive power-to-weight ratio. With the Performance Pack the TSO accelerates to 60 mph in 4.1 seconds and to 100 mph in 8.5 seconds. Huge 340mm AP Racing brakes deliver a 0-100-0 time of 12.9 seconds. Overtaking is effortless with a 50 to 70 mph time of just 2.1 seconds. Top speed is over 185 mph.